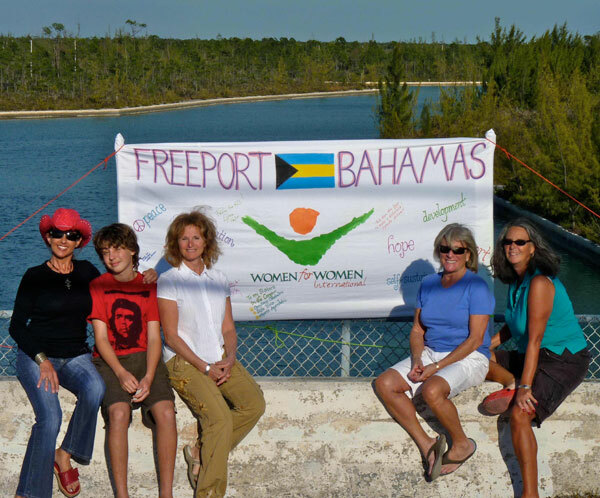 The Bahamas - On March 8th, women, men, and children from Freeport, Grand Bahama Island are set to make history by joining together on the Garden of the Groves’ Labyrinth and Bridge to mark the 100th anniversary of International Women’s Day. We will be calling for an end of violence against women in war-torn countries across the world, including Afghanistan and the Democratic Republic of the Congo, two of the most dangerous places in the world to be a woman. Last year over 20,000 people took part in the first ever global Join Me on the Bridge campaign www.womenforwomen.org/bridge with 119 events including in Afghanistan, the Democratic Republic of Congo, Kosovo, Canada, the United States and The Bahamas. In 2011, hundreds more events, with thousands more people are being planned. The global campaign is being organised by Women for Women International www.womenforwomen.org ; (a charity that helps women in areas of conflict to rebuild their lives, with a coalition that includes Amnesty International, the Fawcett Society, Oxfam and Women’s Aid, CARE, Global Changemakers at the British Council, U8, Save the Children, the White Ribbon Alliance and the Women’s Institute. The concept is simple; women, men and children whether it’s 3, 300, 3000 or more can join together on a bridge near them and hold up banners asking for an end to violence against women in war-torn countries and for them to have better representation at the peace table. 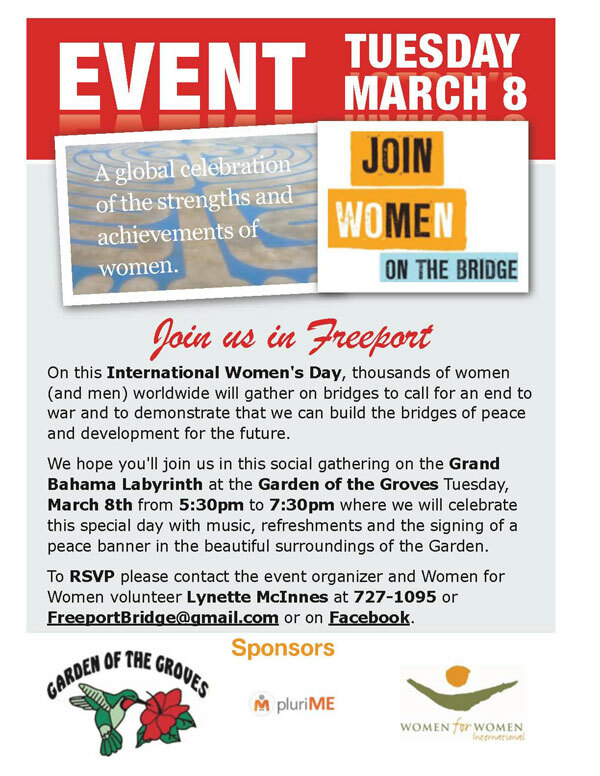 The local event in Freeport, Grand Bahama Island will be a social gathering on the Grand Bahama Labyrinth at the Garden of the Groves Tuesday, March 8th from 5:30pm to 7:30pm where attendees will celebrate with music, refreshments, joining on the bridge and signing the peace banner in the beautiful surroundings of the Garden. To RSVP please contact the event organiser and Women for Women International volunteer Lynette McInnes at 727-1095 or FreeportBridge@gmail.com or on its Facebook event page .